I have had a few new clients ask me what was involved in the miniature-making process, so I thought I would list it here for your reference. As far as the production process goes it's usually broken down into a series of phases. • Packaging and Distribution - copies are placed in sellable packages (blisters, clamshells, etc.) and shipped. Many contract casters will offer a variety of these service to somewhat different extents. You can learn more about the spin-casting process at the Conenti web site. Generally I have several steps that I go through in the process of creating a sculpt and it allows me to stay organized when dealing with many different clients at once. Over the past couple of years I have sculpted literally hundreds of models using this process. • Armatures - generally once I build an armature and pose it I will "block out" a bit of it with rudimentary anatomy to give it a sense of weight and direction. Typically this is done with a 50/50 mix of ProCreate and Apoxie to provide a strong understructure and solid core that does two things. First it gives me a stable surface to work on and keeps the wire from flexing. Secondly it makes the model a little more ridged to withstand the pressure of moldmaking. Once the armature pose is approved I will begin the actual sculpting process. • Basic Anatomy - this is the stage that I refer to as Basic Anatomy even if the figure is mostly covered in armor or clothing. It essentially shows the very undercore of the model and whatever features will be closest to the skin. If there are costuming elements that are skin tight, I will cut in edges around these areas and add basic wrinkles and folds as necessary. After this phase is approved I will Finish the figure. • Finishing - this phase is where I will do most of the recognizable work and may involve many passes to get all the various components modeled. If there are layers of coats or capes, sections of armor and any other distinct features, these will be added in stages and cured or baked to assure they are not damaged while working on other areas. On simple figures this is usually the final phase. • Detailing - many sculpts require detailed accessories and equipment, rivets, buckles and other accoutrements. While a lot of these items are added during the Finishing process sometimes, if they are extensive, it will occur at the end. • Completion - this is where I will base a figure or add a tab to the feet and so forth. The model may be sprayed with Dulcote to assist in the photographing and molding of the sculpt. I will then package and ship the figure off to be molded. These stages are laid out to provide a work flow with the client so that adjustments or corrections can be made before moving on to the next phase. 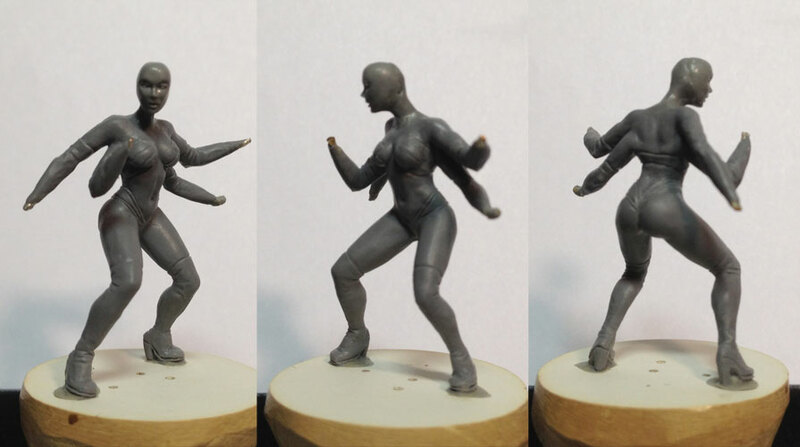 It is much easier to adjust a pose on the model during the Armature phase than during Detailing. If the face needs to be reworked it's better to replace it during the Anatomy phase than when it is in Completion. Some of these later stage corrections can incur additional costs due to the extra time and care it will take to make them without damaging other areas of the model. Revisions are a necessary part of the work we do as sculptors. All clients have revisions and almost all models will require a bit of tweaking at certain points. Some revisions are reasonable. Some require excessive amounts of work involving cutting away previously sculpted areas, grinding out large portions of the model and rebuilding understructure. In order to head that off, this workflow makes it easier for me to complete the project in a timely manner and assures the client it will be completed on budget. Going through an extensive revision process on a figure also affects the working time of other models. If I am working on several pieces for the same client or even different ones, the time it takes to go back and rebuild large areas of one piece slows the productivity of the time I can spend on the other waiting pieces. So, it affects the whole schedule. Hopefully this will give some insight into what is involved in producing miniature gaming figures. All sculptors have different methods and procedures for completing their work. Through experience I have developed this process for myself which allows the greatest flexibility to assure the client gets the piece they want and I can deliver it in timely and economical way. We are all in the same business, to make the coolest possible figures we can and get them to the folks that want them. I am very excited to finally launch Bombshell Miniatures! Over the last couple of years I've kicked around the idea of starting up my own boutique line of girl-centered figures. After making several new friends in the industry and reaching a level in my own work, I felt the time was right to give it a go. Many of you may remember when I first started sculpting, I released a small run of original pieces like the Steampunk Cowgirl and the Spider Queen, some of which are still circulating. Being such a new sculptor and not having the exposure of the internet, that first line was a real struggle to maintain, promote and sell. This time we have a fantastic group of contributors and artists with diverse talent, some of whom have provided work for the big companies and miniatures lines like Games Workshop, Privateer Press, Reaper Miniatures, Dark Sword Miniatures as well as companies outside of the miniatures industry. I cannot begin to describe how thrilled I am to collaborate with some of the talented new people and friends I have made over the course of my recent sculpting career. Hopefully you will be as excited with the work we will be putting out as we are.